With the release of Touch KO, Chillingo takes the heavyweight title for boxing games on the iPhone, with hard hitting gameplay, impressive graphics, and an inventive control scheme. Any would-be contenders to the genre are going to have a hard time taking the title from this champ. 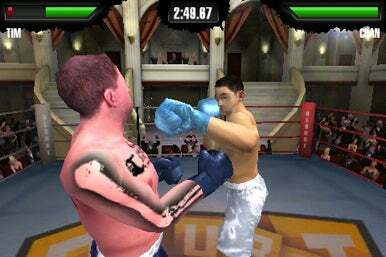 In the Squared Circle: Among Touch KO’s stronger points is a buttonless control scheme, where each side of the screen controls the respective fists of your boxer. Touch KO has two modes of play—Quick Play and Career Mode. Quick Play, as the name suggest, is just a one-time fight while in Career Mode, you’ll work you way up from the amateur ranks to prime time championship fights. Between fights you can train to increase your stats for stamina, strength, or agility. You don’t actually do anything in training; you just select which attribute to train and it happens automatically. Aside from training, you can also upgrade your gloves and other equipment with the cash you win from fights. New gloves, trunks or shoes increase either your strength, stamina, or agility, allowing you to customize your fighter to match your fighting style. Touch KO sports an awesome buttonless control scheme with each side of the screen controlling each arm of your boxer. Throwing one of three punches is as easy as preforming a tap to throw a jab, a horizontal swipe to preform a hook, and a vertical swipe to deliver a crushing uppercut. With a little practice and some good timing you can string these attacks together to make for some nice combos. Unfortunately, there are no body blows in Touch KO—just head shots. You block your opponent’s blows with a tap and hold on the side you want to block; to block with both hands, you just tap and hold both sides of the screen at once. You can also dodge left or right by quickly tilting the device in either direction. Between rounds, you act as the ringside cut man, healing some of the damage your fighter has taken by quickly rubbing his face. Touch KO features some really impressive graphics. The fighters are highly detailed with realistic looking textures, and the ringside backgrounds are nice as well. Whenever a player gets knocked down there’s a pretty cool slow motion replay of the hit. Complementing the graphics nicely are the sound effects and an original rap song that sets the perfect mood for some boxing action. With the high-end graphics and tons of on screen action, Touch KO is a game more suited to the iPhone 3G and 3GS. If you have a first-generation iPhone or iPod touch, you may want to pass on this one for now. When I tested it on an original iPhone, the game was fraught with lag even after I restarted the device. Touch KO is the best boxing game available on the platform so far, even if there are a few areas that could use a little tweaking. For one, the opponents’ AI seems to be a little weak, making for a somewhat easy climb to the top, though the developer is said to have a more challenging “expert mode” in the works for a future release. Hopefully, Gameloft will throw in body shots and a multi-player option, but even in its current state, Touch KO is a great game that’s easily worth the cost of a download.